The Irish News front page sums up what most people may be feeling following the death of three teenagers in Cookstown, County Tyrone, on St Patrick's Day - "Disbelief". The paper devotes eight pages of coverage to the tragedy. Eyewitness accounts tell of the horror outside the Greenvale Hotel on Sunday evening both as the tragedy unfolded and its aftermath. 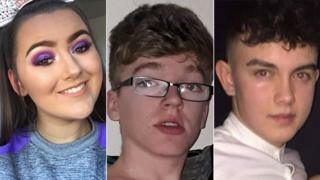 The Irish News also profiles the three young people who died, Morgan Barnard, Lauren Bullock and Connor Currie. The paper's editorial describes the tragedy as "almost beyond comprehension" and says that the families who lost children "deserve to be given all available information". The Daily Mirror leads with the same story and includes the deaths of two County Down men in a crash in County Louth and the death of a young mother in the same county, under the headline: "The Darkest of Nights". Ruth Maguire, who lived in Newcastle, County Down, went missing from a hen party in Carlingford on Saturday. Her body was recovered from the sea on Monday afternoon. Martin Patterson from Bryansford and Shane McAnallen from Castlewellan died in a crash just outside Carlingford in the early hours of Monday morning. It has been reported that police has attempted to stop the car in which they were travelling before it left the road. The Belfast Telegraph leads with the same stories, with the headline: "So much to live for". "We cannot know what plans they had invested in their lives with memories of what they were," it writes in its editorial. The Cookstown horror is also the lead story in the News Letter. Like the other papers, it carries the PSNI's appeal for information about what happened, including testimonies from young people who may be under age. Police are telling teenagers who may have been present "not to be concerned" about coming forward. The News Letter also turns its attention to politics and Brexit. It describes comments from the "Brain of Brexit", Tory MP Dan Hannan, that the DUP could change its mind on the backstop "in return for money" as "withering". Mr Hannan believes that "unionism has a materialistic side". The paper also carries comments from DUP MP Nigel Dodds accusing the Northern Ireland secretary of "glaring failures" in her performance. Sam McBride, the paper's political editor, cites this as evidence that Karen Bradley "has now lost the confidence of the leaders of unionism".